Can I just say…Oh. My. God. Yes, My God! A long awaited dream is about to become a reality and God made it happen. I am beside myself. I want to laugh and cry all at the same time. 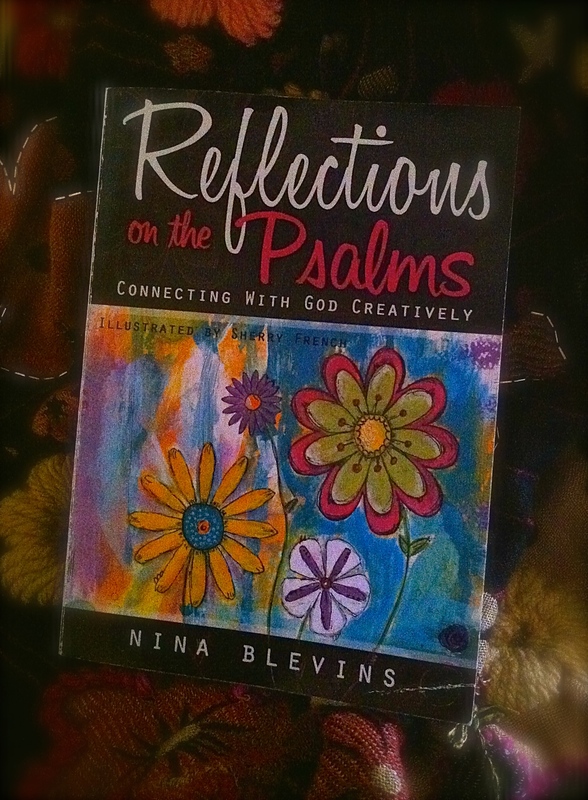 Three years ago this very month God gave me the vision for Reflections On The Psalms, Connecting With God Creatively. I had written a few devotions for a Bible study I taught on the Psalms a couple of years earlier. They were really just reflections from my own personal life experiences. There wasn’t anything fancy about them. It was just me putting to words the different ways God worked in my spiritual journey. It was just me journaling the journey….creatively. God is the Creator of all emotion and feeling. It’s what we do with it that makes it right or wrong. It’s how we act it out that makes it holy or unholy. It’s why Paul tells us in Scripture that we’re to “put off” certain emotions and “put on” others. I have a responsibility to use the emotions God has given me in a way that honors Him. Scripture also tells us “nothing is hidden from God.” That means He knows what’s hidden in the deep places of my heart and soul. He’s able to take what I give Him, no matter how ugly it is, and make an honest woman out of me by washing me in the water of His Word. Sometimes I have to confess what’s not very pretty to receive the cleansing needed for beautiful change. That’s why I love the Psalms. No matter what emotion is expressed the focus is always on God. The psalmists express themselves freely, transparently, openly…honestly. Every emotion is revealed…the good, the bad, and the ugly. It’s all there. And, yet, in every psalm God is still glorified because these psalmists were God-seekers and God-seekers want to know their God to have the heart of God. I learned a long time ago the importance of being completely honest with God about my feelings and emotions. The Book of Psalms helped me learn to bare my heart–to “let it all out.” As I’ve read, reread and studied the way the psalmists expressed themselves to the Lord, I learned that the best way for me to draw close to God is to be honest with Him about what is in my heart. The more I talk to God, the less I want to unload on the people in my life who mean the most to me. Writing and journaling my thoughts becomes a sweet release for me, and I believe it becomes a sweet aroma to Him. Did you know that the Greek word for psalmos, which is where we get our word psalm, means: “A poem sung to the accompaniment of stringed instruments”? I don’t know about you, but that means a lot to me. So many of us have this idea that we can only talk to God by praying reverently with our eyes closed and heads bowed low. Don’t get me wrong; I pray like this too, but what if we allowed ourselves some room for creative expression like the psalmists? After all, Scripture tells us that King David not only sang before the Lord, he danced too, and the patriarchs set up memorial stones to remember those times and places when God did amazing things in their lives. Sounds a lot like creative expression to me. I’ve written thirty devotions from my heart. Sherry French has created beautiful artwork from hers. This is a collaboration of two kinds of God-given inspiration. Following each devotion you will find a blank page where you can explore ways to connect with God creatively. Maybe you like to draw or paint or write. It’s not about what creative style you have; it’s about connecting with God creatively. Let God guide you, and enjoy the process. Instead of a prayer prompt or question to ponder at the end of each devotional, let the daily Scripture verse speak to your heart. Ask God to show you how to apply it to your life, as He showed me how to apply it to mine. Reflections On The Psalms will be released on February 10 through Tate Publishing & Enterprises, LLC. You’ll be able to find it in the data bases of most bookstores and Amazon.com. Sherry and I will keep you updated on our blogs. (Sherry’s website is http://www.thesplendiferouslife.com.) There will be a FaceBook page where you can order books OR if you’re somewhere nearby Sherry and I will be hosting book signings, as well as mini retreats/workshops to help you find your creative voice. To all of you who have read my blog over the past year I’d like to thank you. I may not have many followers or even many viewers, but I know God has given me the gift of words. And now, He’s given me another gift…a published book. My honest little heart is full of emotion right now. For those of you who may consider purchasing a copy, can I just say….Oh. My. God! Thank you. I am beside myself. I don’t know whether to laugh or cry, but may the focus be entirely on Him!